Find out about our next sound healing teaching, concert and presentations. Plus other guest teachers coming through our center. The Sage Academy Of Sound Energy offers a Certificate Program in Sound Healing -- the study of the therapeutic effect of sound on human beings physiologically, psychologically, emotionally and spiritually. The program is a comprehensive curriculum designed to provide students with a broad perspective on this expanding industry, enabling them to focus on their areas of interest. 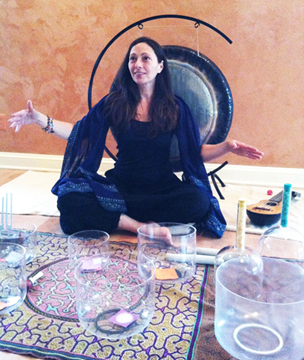 SAGE ACADEMY OF SOUND organizes retreats on how to integrate healing sound into your life. The most well known being the Annual Sound Healing Retreat Intensive & The Yoga Of Sound taking place at Menla Mountain retreat, upstate New York and GONG CAMP with Grand Gong Master Don Conreaux at Ananda Ashram in Monroe, NY. Learn from the foremost experts in the art and science of sound healing coming together to train and teach the therapeutic effects of sound energy. Sage Academy Of Sound has chosen the path of quality over quantity to offer the best tools in the field of Sound Energy Therapy. The world’s foremost teachers in the art and science of sound healing collaborate with SAGE ACADEMY OF SOUND. Come join us for the many retreats, teachings and extended workshops where they share their expertise .